On Friday March 29th, Perth Upon Tay , Branch 244 supported a social night for the “Docs on Ice” hockey tournament. The social night was being run by Perth’s Project Trauma Support, one of the tournament's charity recipients. With Poppy Fund donations from Lanark Branch 395. ($250) Carleton Place Branch 192 ($1,000) and Perth’s Branch 244 ($7,000) we were able to give Trauma Support $8,250. 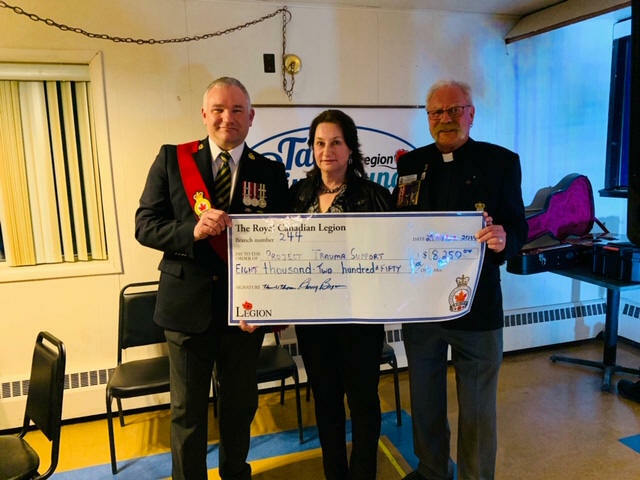 Pictured are Perth’s Poppy Chairman Stacey Niceliu and Carleton Place’s Father Dave Andrew presenting Dr. Manuela Joannou with the cheque.